2018 Letter Carriers Annual Food Drive | IBEW 569 Gives Back! IBEW 569 is pleased to support the 2018 National Association of Letter Carriers (NALC) Food Drive to help feed thousands of community members throughout our region. Join IBEW 569 on Saturday, May 12th at 5:00pm and bring the entire family and/or a team of co-workers to this wonderful event which collects more than 150,000 pounds of canned food for communities in San Diego County. 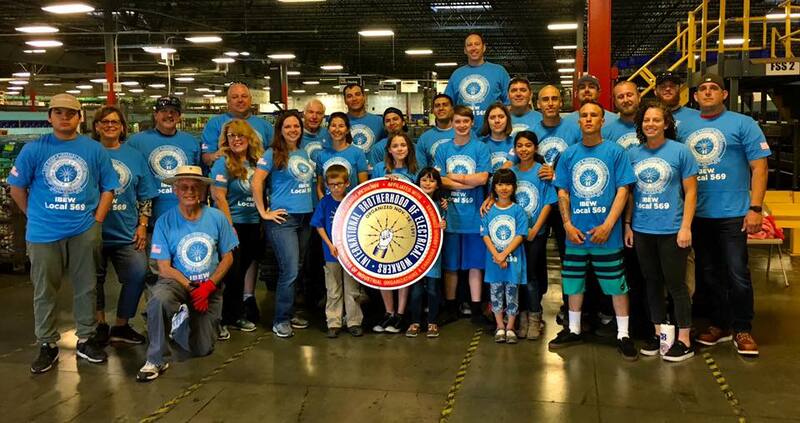 50 IBEW 569 volunteers are needed to help unload and transfer food from the Post Office into Teamster trucks that are then transferring the donations to the San Diego Food Bank! * Support organized labor and your fellow union members by wearing your union colors. * Dinner will be provided! * Entrance to the Carmel Mountain U.S. Post Office enclosed parking lot is located at the end of this street: 11251 Rancho Carmel Drive, San Diego 92199. Drive through the gates to the parking lot and then walk to the rear of the building to access the Post Office - look for the Teamster Trucks! Questions? Contact Jeremy Abrams of IBEW 569: jabrams@ibew569.org or 619-957-6569!